Colston Bassett and District Dairy was built in 1913 thanks to the efforts of Dr. William Windley, who encouraged local farmers to raise capital to build a dairy. 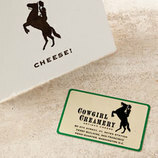 At the outset there were about 16 farmer members supplying milk to the dairy. 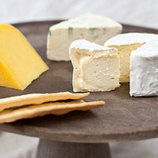 The first cheese produced was a hard-pressed Cheddar-style, and by the 1950s, Stilton was produced throughout the year. Over the years the number of farms supplying the dairy has dropped from 16 to 4, but interestingly, the total amount of pasture has remained the same, the reduction being due to farm consolidation. Colston Bassett continues to make every effort to adhere to traditional production methods, including hand-ladling curds. 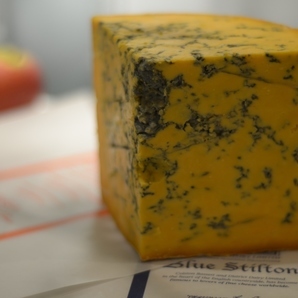 Shropshire Blue, also known as "orange Stilton," is a slightly milder version of the original, offering a fruity tang and a texture reminiscent of cold butter. The paste is dyed with annatto, a natural food dye that comes from the tropical achiote tree. The annato reacts with the curd by softening it slightly and making it slightly creamier than the original version.